Some people are good at being thoughtful and can go out of their way to help others. They naturally recognize what the kind and considerate thing to do is, and they do their best to make this happen. 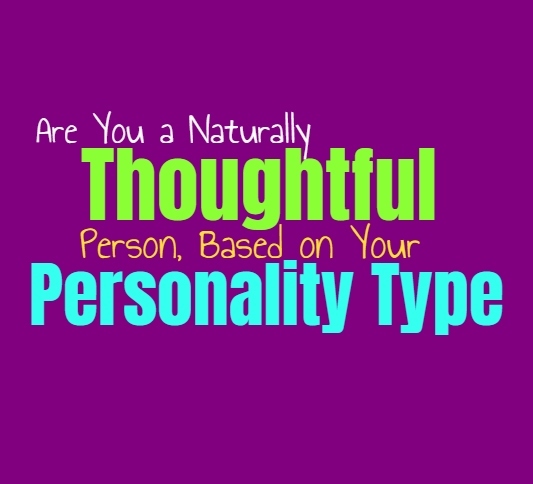 Here is how naturally thoughtful you are, based on your personality type. ENFJs are thoughtful people who almost always consider the feelings and needs of those around them. They don’t want to let anyone down and work hard to be able to provide for them and make them happy. For the ENFJ it is important to be supportive of the needs of others, and always be thoughtful of their actions. They will often go out of their way to do nice things for the people they love and to support them when they really need it. ENFJs even do thoughtful things when it isn’t obvious or needed. INFPs are definitely thoughtful, and they care about doing nice things for those around them. They want to be supportive of their needs and try hard to always be considerate. INFPs care about helping and making a difference in the lives of those around them. They are certainly thoughtful but often they like doing when it isn’t required or demanded of them. INFPs will go out of their way to come up with sweet and thoughtful things for their loved ones, but they want to feel like this is their own choice. ENFPs can be thoughtful in different ways than most people recognize or expect. They care about their loved ones and want to do whatever they can to make them happy. ENFPs do however get so caught up in their own minds that they become distracted from certain things. They find ways to be thoughtful when it is least expected, and in ways that mean a lot to them personally. They care about their loved ones but their means of being thoughtful aren’t always easily understood by others. INTJs are certainly more thoughtful of others than people realize, they just don’t express this in ways they might recognize. When the INTJ truly cares about someone they think about them often and the ways in which they can help them better their lives. While they might not show this by being sensitive or emotionally expressive, the INTJ is always thoughtful of the ways they can improve these relationships. They will often do practical and thoughtful things for their loved ones, often in ways that others might not realize the intentions like they should. ENTJs definitely try to be thoughtful of others, especially the ones they care most for. It can sometimes become lost and people don’t always recognize how thoughtful the ENTJ is of their needs. This is because they are not emotionally expressive people and instead strive to show their consideration in more practical ways. They might not be so thoughtful of the smaller details or things which seem less important, but when it comes to truly important life needs the ENTJ is good at being thoughtful. They are likely to be the people asking their loved ones if they want something from the store when they go, and are good at remembering those types of tasks. INTPs care deeply for their loved ones and think about them often, but their consideration can be hard to recognize sometimes. This is because INTPs can become so caught up inside of their inner minds and so it makes it difficult for them to really recognize what is going on around them. While their loved ones might be on their minds constantly, they don’t always know how to show their affections openly. They might forget smaller details without realizing it, and aren’t always good at being on time. ENTPs aren’t always great at being thoughtful when it comes to small details which seem insignificant to them. They do think about others and often consider the ways in which they can be supportive and help them improve their lives. While they think about their loved ones often, they just aren’t great at remembering smaller details and being thoughtful in those ways. They do however try to be thoughtful with things which are more serious or important. ISTJs are often very thoughtful when it comes to the practical needs of others. They are polite people who believe in being considerate of things, at least in a practical sense. They aren’t necessarily good at being thoughtful of the emotions and sensitivities of others, simply because this does not come naturally to them. They do try hard to work on these things but ISTJs are practical and focused people, who just don’t like dealing with emotions and things that are difficult to really understand. ESTJs are very practical people and so it is easy for them to focus on the needs of others in this way. They can be thoughtful when someone clearly needs help with something, and are usually good at remembering the foods they like when they go shopping. Those are the little details ESTJs are often very good at and thoughtful with. Where they struggle is when it comes to emotions and being able to express thoughtfulness towards the sensitivities of others. ISFJs are extremely thoughtful people, especially when it comes to their loved ones. They are supportive of others and do their best to always be there for them. They want to be supportive of the practical and emotional needs of the people closest to them, and even those not so close to them. ISFJs are naturally thoughtful people and find it more natural to consider the feelings and needs of those around them. ESFJs are very considerate and thoughtful people, especially of the needs of those around them. They care about being there for them both in practical and emotional ways. For the ESFJ it is important to always be thoughtful, especially when someone is clearly in need of their help and consideration. They want to be there for their loved ones and do their best to provide for them in any way they possibly can. ISTPs sometimes struggle with being thoughtful of the emotional needs of others, but that doesn’t mean they don’t care and are not thinking about them. They can become so caught up in the moment and this causes them to become a bit distracted with certain things. ISTPs try to be there for the people they love, but this doesn’t necessarily mean being thoughtful in ways that people will recognize in an outward sense. ESTPs are actually rather thoughtful people, especially when it comes to their loved ones. When they care about someone they are likely to try and do little things which can help them. They might grab little presents for them and try to remember their favorite foods are items when they are out. ESTPs might not be great at being thoughtful when it comes to emotions but they do want to be able to think about their loved ones and be considerate of them. ISFPs care about being thoughtful of others, but sometimes they can find themselves distracted. They focus so much on living in the moment and so sometimes they can forget smaller details which others might consider thoughtful. While they might be distracted and focused on the moment, ISFPs actually really do care about others and think about them and their needs far more often than people realize. ESFPs care about their loved ones but they express their thoughtfulness in different ways. They are thoughtful when it comes to the little things, and want to be able to make the people around them happy. ESFPs are thoughtful when it comes to birthdays and being able to come up with the most personal and thoughtful presents. They care about their loved ones and want to always be thoughtful towards them, but their practical needs aren’t necessarily where they are capable of being more thoughtful.